Ohio has a very large biodiversity of species of amphibians and reptiles. Just as there are many species of frogs, toads, fish and snakes that can and do reside in Ohio, it has been found that there are also many species of salamanders (Salamandridae) that make their homes here too. A salamander’s habitat may be terrestrial or aquatic depending on the species. Salamanders tend to make their homes more so on land though, newts and mudpuppies- subfamilies of the salamandridae family, are aquatic. There are exceptions to this of course; some salamanders are aquatic and some newts are terrestrial. Mudpuppies are fully aquatic as far as we know though, no exceptions. I suppose this may be a little confusing unless you are an expert on amphibians who specializes in the study of salamanders. 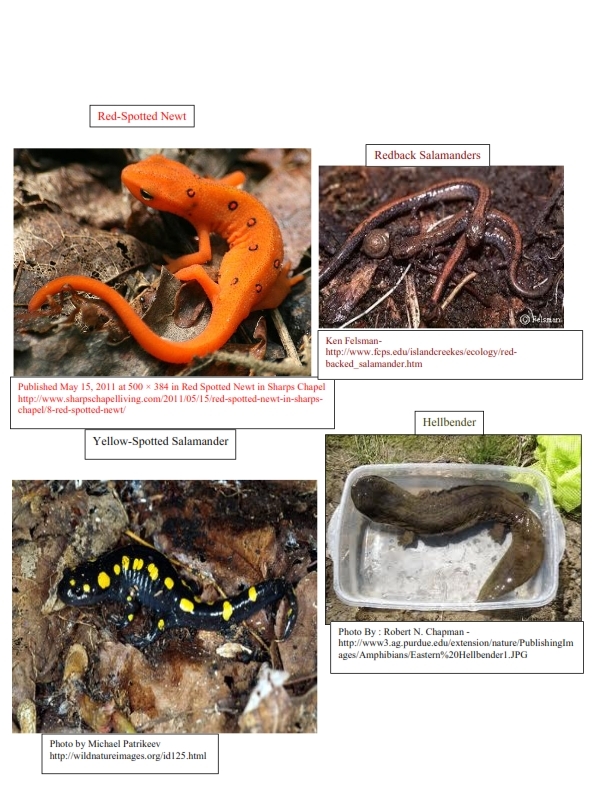 Perhaps some of the most common salamander species found in Ohio are the Northern Dusky, Redback, Spotted, Red-Spotted Newt or Red Eft, and the Northern Two-lined. Another salamander that can be found in Ohio is the Hellbender. This is a fully aquatic salamander, spending all of its time in water. It is the largest amphibian found in Ohio, and can reach up to twenty-seven inches long. Ohio has a rich biodiversity of salamanders perhaps due to its rich geological variety such as rivers, wetlands, forests, rocky ledges, etc.., where their habitats could be located. Just as any other species the salamanders are threatened by deforestation and our ever-growing human population. Some salamander species are already on the endangered list such as the Hellbender. Species that are endangered have a higher risk of becoming extinct, and therefore decreasing the land’s biodiversity. I’m glad you point out the habitat diversity in salamanders and their diversity in Ohio. Plethodontids, especially, are near the location of their diversification, just over in the Appalachian mountains.